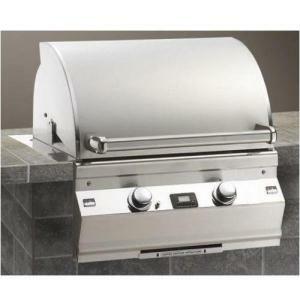 Fire Magic's two burner propane gas grill, the Aurora A430 Built-In, beats most of the competition in terms of efficiency and quality, but is still several steps below one of its competitors, TEC. With less efficient infrared burners and fewer options, this built-in unit is still solidly built and at least near the top of the ladder. The large cooking area of 432 square inches is evenly heated by two ceramic infrared style burners. This is a more traditional build than TEC's even with the advanced burner system, still allowing flow of hot air directly from burners to food. That's something we've always been able to deal with, and the burners are a genuine improvement over lesser systems, spreading heat out over more of the cooking grid. You'll still have some hot spots, and many of us have learned to use them well. Designed to be built into a cooking island, this very capable grill does have a long list of good extras like battery-powered electronic ignition, a digital cooking thermometer with meat probe, and disposable drip tray liners (a small but convenient cleaning bonus). The cabinet and burners have a lifetime warranty for the original owner, but that warranty is not transferable. If you like to cook with charcoal now and then, an optional charcoal basket is available that fits over the burners, so you can light the coals with propane and then switch off the gas and work with wood heat. Back burner and rotissierie are not included with this built-in, but all in all, it's a great grill, a year or two behind the best.